It’s convenient to set your favorite site on your SurfTideΔ app. 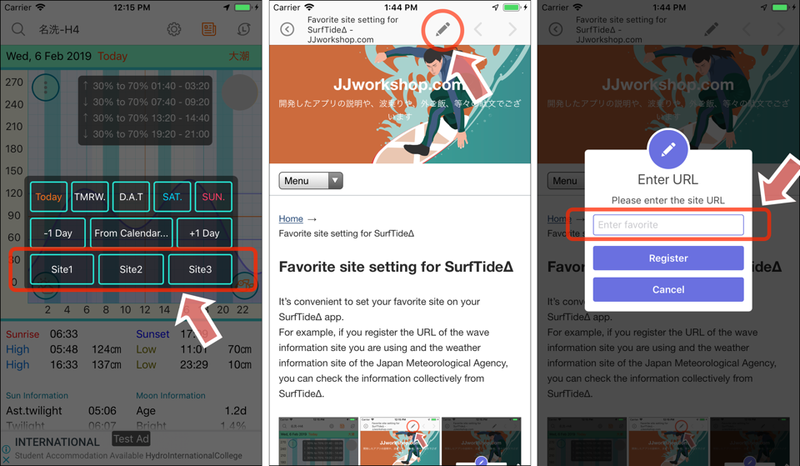 For example, if you register the URL of the wave information site you are using and the weather information site of the Japan Meteorological Agency, you can check the information collectively from SurfTideΔ. You can set the URL with the “Pencil” icon tap at the top of the screen. After setting, If show “URL is incorrect.”, the URL is written incorrectly. Please reset the correct URL beginning with “https://”. URLs starting with “http://” can not be registered. I introduce a convenient site when registering by fishing or surfing here. URL can be copied and pasted.